Looking for cheap flights to South Africa? Easier said than done. You could find yourself lost amid a multitude of websites and travel agencies. Each one of them trying to sell you their "cheapest airfare deal of all times". It's almost like looking for a needle in a haystack. So, how can you see the forest through the trees and find the best cheap air ticket deals possible? Learn more about the easy way how to do this. Using the booking and flight search form below, all you need to do is fill in your departure and destination cities together with travel dates and it will give you a complete list of all airline companies flying on those particular dates in one go, together with their flight schedules and tariffs. Use it to compare international and domestic flights and if you are happy with what you see, you can just continue and complete your booking. In addition and for crosschecking purposes you can also use the list of all airlines flying to and from South Africa. Selecting anyone of them will take you to the booking page of that particular airline company, where you will find all the information you want about flights and airfares to South Africa. This way you can cross check the above flight search engine results. O.R. Tambo International Airport at Johannesburg South Africa. As major airport hub in Africa, especially beneath the Sahara region, O.R. 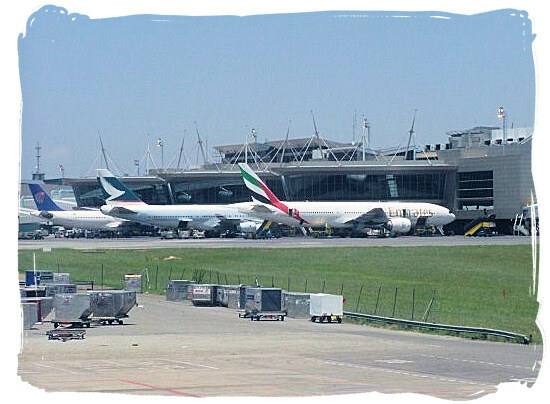 Tambo International Airport is often called the Gateway to the African Continent. With all the characteristics of a world class airport, it is ideally situated less than 25 km from the center of Johannesburg in the economic heart of South Africa. Encircled by an excellent road structure, O.R. Tambo airport is the flagship of the 10 international airports in South Africa, which are all managed by the Airport Company South Africa. With a maximum capacity of 28 million, the airport handles more than 21 million passengers annually. The processing capacity for freight stands at a maximum of 650,000 tons per year. In this guide you will find all the answers. Read the guide on how to find and book cheap airfare tickets to South Africa. Check out the flight search engine and booking system. Use the recommended online flight and airfare comparison websites. Double check your findings by going straight to the airline company's website. 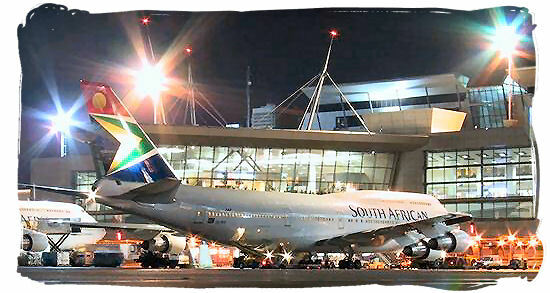 You will find a complete list of all airline companies flying to and from South Africa on this page. Everyone familiar with the use of internet knows what cookies are. These are tiny data files used by websites to collect information. Such as for example your search behavior and the kind of information you are looking for. They do this via the browser of your computer. Keep in mind that websites of airline companies do this too. Flight search engines and online flight ticket booking sites have the capability to keep and use the information they have collected from you. It puts them in a position to amend and adjust the air ticket prices they offer to correspond with your search behavior. More often than not the end result is an upward trend in their airfare rates each time you do a flight search on their website. The important thing here is their knowledge of your search behavior and your preferences. If you can keep that away from them, they can no longer influence your search for cheap airfare tickets. That would mean blocking their trackers and taking away the ability to store cookies. You can do that by using an incognito browser that will prevent your browsing activities and search behavior patterns from being recorded. Whilst hiding your search behavior may be enough when searching for cheap airplane tickets, it doesn't mean that you are completely invisible. Your computer ID in the form of its IP address remains visible for the websites you are visiting. Which means that they can see when and how many times you have visited them, but no more than that. To be fully invisible and anonymous, you will have to conceal your computer IP address as well. For that you can use a VPN server. VPN stands for Virtual Private Network. It gives you encrypted and anonymous access to the internet. Operating in the background it, will not affect your computer in any way at all, and they are easily available on the internet. Major browsers such as Google Chrome, Mozilla Firefox, Internet Explorer and Microsoft Edge offer the incognito function built into their browser. Using Google's Chrome browser for example, all you do is click on the button with the three dots in the far right top corner of the toolbar and then click on "New incognito window". Arrivals hall at O.R. Tambo International Airport. The arrival hall at O.R. 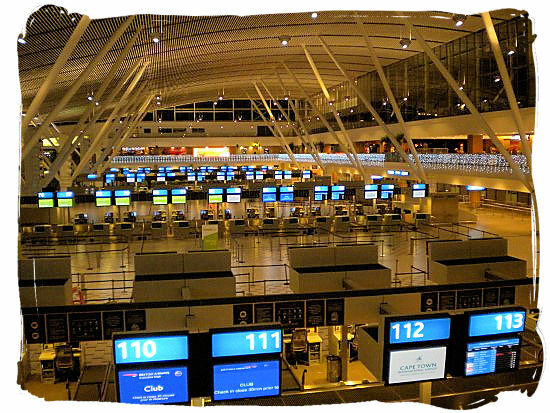 Tambo airport is spacious and comfortable, an ideal place to await and meet returning family and friends that you have been separated from for a while. In the hall there are areas with seats for the waiting and there are also useful services available such as currency exchange desks, information desks, mobile phone and accessories kiosks and a variety of car rental counters. Instead of you endlessly juggling and comparing dozens of airline websites, a flight search engine does that for you in matter of a few mouse clicks. It will give you a wealth of information on flight schedules and cheap flight ticket specials of most if not all airline companies flying to your selected destination. Like for example the cheapest airfare between all those airlines for each specific day. The problem is that there are several such search engine sites, which leaves us with the question of which one you should use. To make it easier, we have selected what we consider to be the Top 5 flight search engines, each one capable of supplying excellent information. Our number one choice out of those five must be the Google flights search engine. Its data base includes the information of more than 300 airline companies. You will find that these are among the most popular on the internet. As I have said, personally I like to use Google flights.com to search for cheap flights to South Africa. Usually my next step is to compare its results with two other search engines in the Top 5. Finally as a last step, I will cross check with the websites of the airline companies I selected. 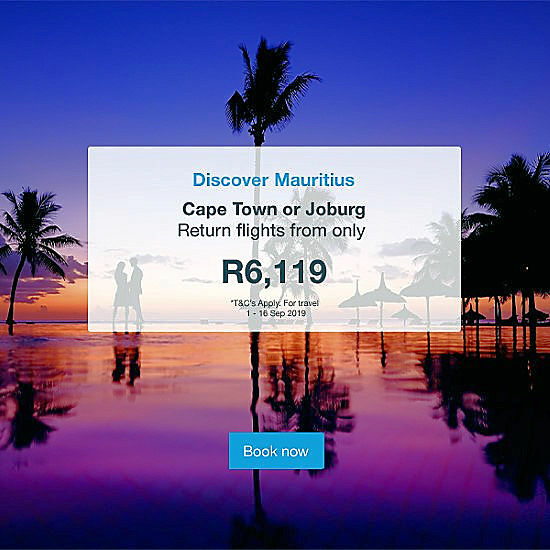 For finding cheap flights out of South Africa as well as domestic flights inside the country, our number one choice next to Google flights.com, is local based Travelstart.com. They are not easily beaten, especially when it comes to finding cheap air tickets for domestic flights. Google Flights.com and most of the other major flight search engines, offer an airfare alert or tracking service. All you need to do is to fill in the details of a particular flight. A warning system will then monitor the airfare of that flight on a continuous basis for a specified period of time. Nice thing about it is that you can follow multiple flights at the same time. You will be informed by email whenever the airfare of one of your selected cheap flight ticket options changes, regardless of how often this happens. That way you stay on top and miss nothing when changes occur, especially when a special offer or last minute flight deal comes past. These airfare warning services are usually completely free and you can terminate them at any time. Truly a great tool which you cannot do without in your search for cheap airfare tickets. Cape Town international airport in South Africa. Known as D.F. Malan airport in its early days, Cape Town International Airport was opened in 1954. It is situated approximately 20 km from the city center of Cape Town. 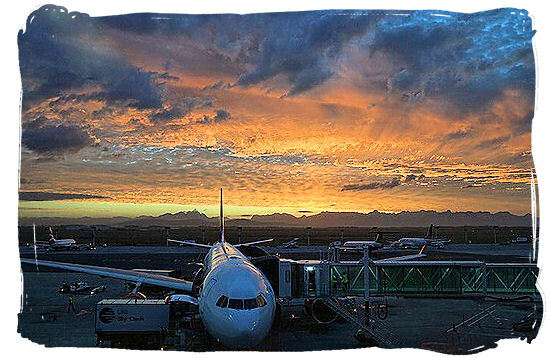 Over the years it has developed into a modern first world international airport, the second largest in South Africa. 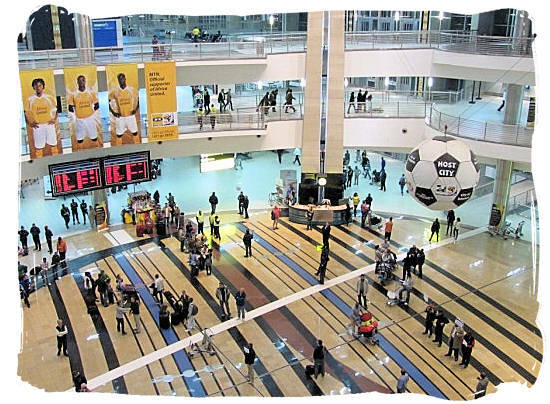 In the run-up to the 2010 FIFA World Championship football held in South Africa in 2010, a large-scale renovation and extension of the terminal buildings has taken place. It has all the modern facilities that one may expect from an advanced international airport. With a capacity of 14 million passengers, the airport processed a total of 13,2 million passengers in 2017. Nighttime view of the apron of Cape Town international airport in South Africa. All about the Google Google flights search engine. A calendar showing the cheapest airfare for each specific day in a particular month. A graph showing how this cheap airfare rate fluctuates from day to day over a longer Period of time. Airfare comparison with flights using different departure, arrival and transfer airports. A filter that allows you to compare and manipulate the effect of transfers, different airlines, price range, departure times, different transfer and arrival airports and multiple tickets from different airlines. An airfare tracking and alert capability. Prices of air flight tickets of most airline companies fluctuate up or down on an almost continuous basis. This has everything to do with the speed at which the available seats on a flight are sold over the period before the departure date. This in turn is determined by comparing sales to projections based on historical achievements. Generally airfare rates will show an upward trend when sales are ahead of schedule and downward when sales are behind. The whole process runs over a period of about 11 months, which is the average length of flight schedules of most airline companies. In most cases this is also the maximum period of time that you can book a ticket in advance. Be as flexible as possible when it comes to choosing dates and places. The particular day of the week, time of the month and time of the year that you choose can make a big difference. If you travel from the northern hemisphere to the southern hemisphere for example, you have two summer seasons to deal with. For the northern hemisphere that is the period June, July and August and for the southern hemisphere the period December, January and February. These are high season periods for traveling, with air ticket prices moving towards the upper end of the scale. February to May and September to November are considered to be the best months to search for a cheap flight ticket. Political, social and cultural circumstances can also have a big impact on the cost of air tickets. Here you can think for example of school holidays and national holidays and for Muslim countries the period around Ramadan. However, when looking for the best time to find and book a cheap flight ticket, it is not only the best month of the year you should look for. It is important to keep in mind that once you have selected the best month of the year to suit your travel plans, there is also a best day of the week. Because even over a period as short as a month airfare rates can change and be different as often as daily or even per half-day or hour. Research has shown that generally speaking, Tuesdays and Wednesdays can be considered as the best days to search for a cheap flight ticket. It is during the night between these two days that the majority of airline companies release their airfare specials and changes to their price schedules. All the above information might well overwhelm you, and you are possibly wondering how you are going to accomplish such a seemingly complicated quest for a cheap flight to South Africa. There has to be an easy way out and fortunately there is. The airport has one main terminal building, with the all departures check-in hall situated in the center of the building, which is linked to the domestic arrivals and departures terminal in the southern side of the building and to the international arrivals and departures terminal in the northern side. Although a direct non-stop flight is the quickest and more convenient way to get to your destination, it is usually more expensive. You will find that in most cases an indirect flight with one or more transfers via one or more airport hubs can save you quite a bit of money. Options worth investigating in that regard are transfer flights with one and the same airline or with different airlines. Flights via airport hubs such as Dubai in the United Arab Emirates and Doha in Qatar for example, are usually available at very competitive rates. Major airport hubs in Europe are Heathrow (London), Schiphol (Amsterdam), Charles de Gaulle (Paris) and Frankfurt (Germany). Look at alternative airports that are close enough to your places of departure and destination. Differences in airport taxes and services can often mean significant differences in air ticket prices. Keep in mind the cost and convenience factors in terms of extra traveling to and from these airports. In general, most airline companies make their flight schedules available 11 months before the departure date. This means that in most cases this is more or less the maximum period of time that you can book an air ticket in advance. It is important to book well in advance, once you have chosen your flight dates. Although some say you should wait until the last minute for the so-called "last minute flight deal". Much depends on the speed with which a flight becomes fully booked over the 11 month booking period. When bookings are slow, airline companies tend to keep their pricing at the low end of the scale. Additionally, if a flight is not fully booked close to the date of departure they will often try to sell the last empty seats by offering cheap last minute flight deals. The longer the period before the departure date, the more difficult it is for airline companies to determine whether a flight is going to be fully booked on time or not. Initially their ticket prices will start at the low end of the scale, but as soon as certainty of booking rates being on schedule grows, they will show an upward trend. It means that if you wait for a last minute deal it could well happen that, depending on the progress of the booking rate of the flight you are investigating, you will end up with an air ticket price at the high end of the pricing scale, instead of the bargain you were looking for. This happens more often than not. You will find that in most cases flight booking rates are ahead of schedule, with the airfare rates moving upward accordingly, as the departure date comes nearer. This indicates that generally speaking, you will be cheaper off when booking your flight ticket well in advance. All this might leave you with questions such as how long in advance should you make your booking to obtain that coveted cheap flight ticket? And looking at the overall booking period, when will it be at its lowest level? As a guideline you might keep in mind that based on various studies it has been established that flight ticket prices are usually at their lowest between 45 and 60 days before the departure date of a flight. Having read all of the above, you might well be wondering by this time how you are ever going to find answers to these questions. All in all it looks like there is a lot of "head scratching" research that needs to be done. But fortunately that is not the case, because there is an easy and efficient way to do all this. "instead of you endlessly juggling and comparing dozens of airline websites in search of information, flight search engines such as Google Flights.com for instance, do that for you in matter of a few mouse clicks". The airport has two runways, 03R / 21L of 3,400 meters and 03L / 21R of 4,418 meters. The latter is one of the longest international airport runways in the world. This is due to the fact that the airport is situated at an altitude of 1750 meters above sea level. The air is a lot thinner then and that is why a higher speed and thus more runway distance is needed for an airplane to obtain the volume of lift necessary for take-off. At the end of your quest for a cheap flight ticket, you should have a short list of flights and airline companies from which to make your final choice. But before you do, just do a double check on your selected airlines own websites. It can easily happen that you find a special or last minute flight deal there that surpasses the ones you found in the flight search engines. Lower down this page is a list of all airlines that fly to South Africa. A single push of a button will take you to the website of the airline company your choice. Airline companies offer their air tickets in the currency of their home base. But normally they let you pay for the ticket in the currency of the country in which you make your booking. In addition they often also offer the possibility to pay for it in one of the major world currencies such as the Euro, the Dollar and the Pound. It is a good thing to compare all your exchange rate options if you have the opportunity and use the one that works out cheapest for you. If your journey consists of more than one flight via different airports and all with the same airline company, it usually works out cheaper to book everything on one ticket instead of booking them separately. The advantage is that if one of your flights is canceled or you miss a connecting flight, there is only the one airline company to deal with. It is their responsibility to make the necessary arrangements so you can continue your journey. On the opposite however, there are occasions where booking a multiple flight journey on separate air tickets and with different airline companies can work out cheaper. More often than not you may find a combination that will save you a considerable amount of money. A disadvantage with separate flights and tickets is that in the case of canceled or missed flights and with more than one responsible airline company, it is not always clear which one will be responsible for the continuation of your journey and that can become problematic. In the end you might well end up in a situation where you have to pay for an alternative flight and/or a new ticket, not to mention the costs of food and an overnight stay, especially in the case of a lengthy interval. 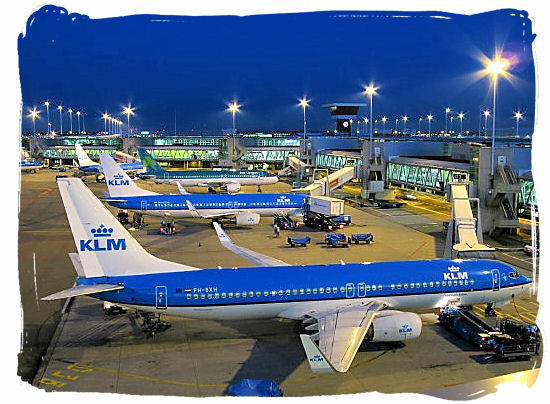 Known by some as Amsterdam Airport, Schiphol Airport is situated only 15 km southwest of Amsterdam in the Netherlands. With 68.5 million passengers and more than 496,000 flight movements in 2017, it is the third largest and busiest airport (after Heathrow at London and Charles de Gaulle at Paris) of Europe and number 12 worldwide. With a total of 6 runways it lies a couple of meters below sea level on the bottom of an ancient dried up lake. The airport uses the one terminal concept, with 3 extensive departure/arrivals halls, all under one roof, housing more than 200 shops, restaurants and fast-food establishments. Known by some as Amsterdam Airport, Schiphol Airport is situated only 15 km southwest of Amsterdam in the Netherlands. With 68.5 million passengers and more than 496,000 flight movements in 2017, it is the third largest and busiest airport (after Heathrow at London and Charles de Gaulle at Paris) of Europe and number 12 worldwide. With a total of 6 runways it lies a couple of meters below sea level on the bottom of an ancient dried up lake. The airport uses the one terminal concept, with 3 extensive departure/ arrivals halls, all under one roof, housing more than 200 shops, restaurants and fast-food establishments. Under US law, a traveler has the right to cancel or change without costs within the first 24 hours after booking an air ticket. Applicable only until 7 days before the departure date, it also requires airline companies to hold a flight reservation for 24 hours before settlement of the airfare. This regulation applies not only to airline companies within the US, but also to airlines from outside the US flying to America. In general almost all major airline companies abide by it. It is nevertheless important to verify the cancellation policy of the airline company you book with to ensure whether the 24 hour rule applies or not. Keep in mind that when you change a flight booking, the airfare may have changed and that the new ticket could be more expensive. Also keep an eye on the airfares for the first 24 hours after you have booked a flight. Because you still have the opportunity to change your booking should you come upon a better deal in that period. Keep an eye out for pitfalls, because they are there. It can easily happen that halfway through the flight booking process you will come upon hidden additional expenses that you did not count on. In most cases however these are special offers of products and additional services that you don't necessarily need. Like for instance paying for extra luggage, special meal requirements or for selecting your seat in advance. Often it comes in the form of temptations such as cheap car rentals or special deals on travel insurance. If you book a transfer flight with a lengthy in-transit period between flights, you have to think of the extra costs of food, overnight stays and in some cases the costs of an in-transit visa. Although traveling via alternative departure and arrival airports may often be cheaper, it could also mean longer travel distances between these airports and your home and destination addresses. A cost factor that might well eradicate the savings you were making on your air ticket. Heathrow London is the largest airport in Great Britain, the largest in Europe and number 4 worldwide. Every day more than 80 airlines fly to and from Heathrow making a total of 1300 flight movements (around 500,000 per year) to and from 180 destinations worldwide. In 2017 the airport Processed 78 million passengers and 1.7 million tons of freight. 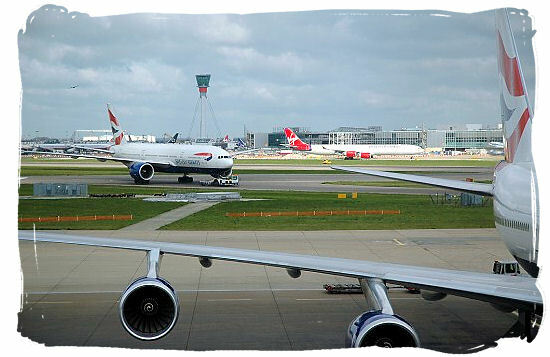 Situated about 25 km west of the heart of London, Heathrow Airport has four terminals and two parallel east-west runways in use, the one for departures and the other for landings. LIST OF AIRLINES SERVING O.R. TAMBO INTERNATIONAL AIRPORT. LIST OF AIRLINES SERVING CAPE TOWN INTERNATIONAL AIRPORT. With the nonstop flight routes you are never more than one flight away from South Africa. The vast majority of flights from Europe generally take place during nighttime. To give you some idea about the time duration of the wide range of flights into South Africa, we have listed below the main stream of international airports with their applicable flying times to South Africa.